Kev Carmody is an ideal way to start the day – to have a legend of Australian music kicking things off on the Novatech Stage is really setting the bar high. He appears on stage and says hello to the packed house, and plays Thou Shalt Not Steal, despite being unable to find his capo. Carmody likes a chat; his stories are inclusive and usually good-humoured, and his songs are touching while being very listenable. Droving Woman is spellbinding, and probably a highlight of the set. Of course, the show wouldn’t be complete without a version of From Little Things Big Things Grow, which arrives as an encore. Carmody is assisted by Mairead Hannan on backing vocals; the crowd loves it. Full of the joys of Kev, I wander down to the Foundation Stage to have a look and a listen to Ladysmith Black Mambazo. Their distinctive and gorgeous collective voice can be heard across the park, but their gently choreographed moves add to the show and are worth seeing up close. They look and sound great, as evidenced by their performance of Long Walk To Freedom. It’s a hot day, the humidity has given way to clear skies and scorching sun; finding shade has become a premium for many. 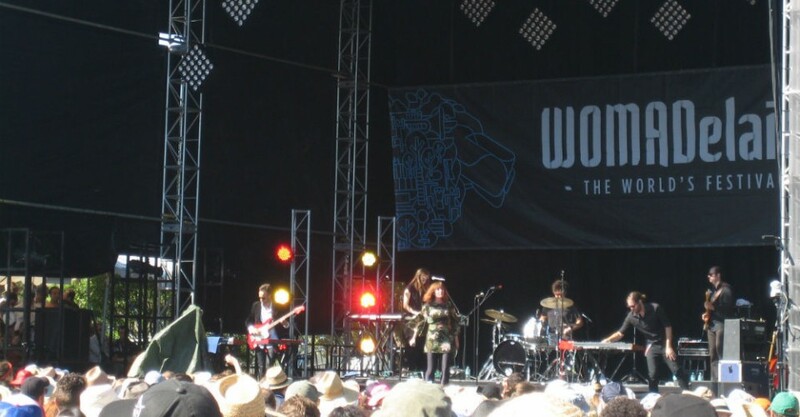 Sarah Blasko gives her one and only WOMADelaide performance on Stage 2, in the mid-afternoon heat. She thanks fans for enduring the weather on more than one occasion but she must have been feeling it too, facing directly into the sun. Blasko’s catalogue of works is impressive, and today’s set is top-notch. Despite the oppressive conditions, she and her band put on a fabulous show, chock-full of anthemic, memorable songs. The Foundation Stage plays host to Spanish flamenco singer Diego el Cigala. The band features, amongst other instruments, upright bass and flamenco guitar, and el Cigala’s voice is splendid. It’s a perfect way to chill out, just a little, after the exertions on Stage 2. The bazaars and food & beverage stalls appear to be doing a roaring trade. The sights and smells of these places are an integral part of the WOMADelaide experience. As are the non-musical workshops and events such as The Planet Talks, Taste The World and Artist In Conversation. And, not forgetting, that you can always take home some of the music you have heard by popping in to see Vic at Mr V Music. Next on my list of people to see is Israeli-born Ethiopian Ester Rada. Consistent with the brief encounter I had with Rada on Saturday, she sings beautifully in both English and Hebrew. She gets the Stage 2 crowd singing along in Life Happens; it’s a nice moment. Calexico appear on the Foundation Stage and, although I’ve already seen them this weekend, I can’t resist the urge to sit under the stars and watch them again. It was the right call. Once again, they are brilliant, playing a set that has a slightly groovier feel than the Saturday afternoon concert. It suits the time of day and the mood of the audience perfectly. It’s getting late, and the crowd builds in anticipation of seeing one of the main draw cards, Ludovic Navarre aka St Germain. It’s turned into a beautiful, breezy evening and the Foundation Stage is bathed in hazy cool light. The band slowly moves into performance mode and, as the show progresses, the beats, grooves and loops hypnotises the eager and enthusiastic audience. Making my way towards the exit, after another day of musical sensory overload, I stop for a second look at Tulegur, the amazing Chinese throat-singing duo. Marvellous.